Mahbubur Rahman, Transformation, 2004–. Performance view, Dhaka, Bangladesh, February 5, 2018. Photo: Tanvir Murad Topu. 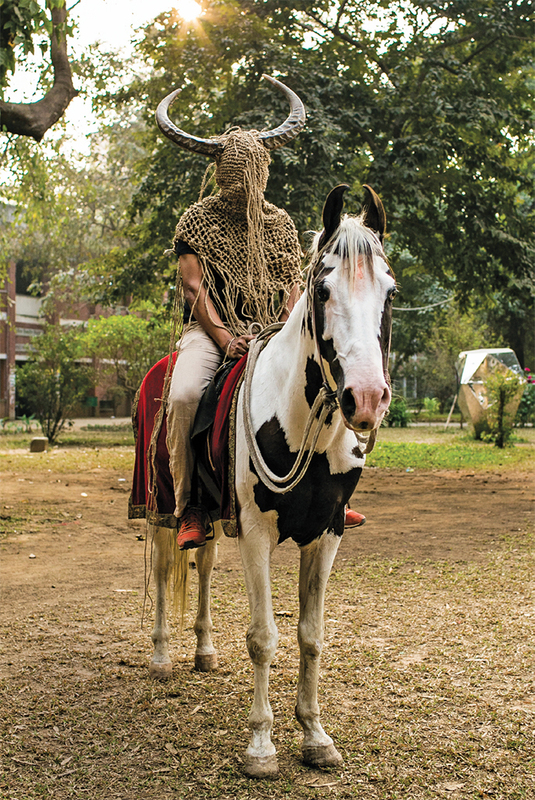 ON FEBRUARY 5, 2018, a half man, half bull riding a black-and-white horse made a grand entrance into the Faculty of Fine Arts at the University of Dhaka, Bangladesh’s premier fine-arts institution. Wearing curved horns attached to a woven rope net that covered his torso, the imposing beast sat on his steed, which was draped with a red caparison, and surveyed the area. Although a strange sight for pedestrians, the bull-man cut a familiar figure for members of the art community, who know him as a recurring character in the work of artist Mahbubur Rahman. Pointedly, he led the charge that evening into an institution where performance art is still not on the curriculum. The event was part of Rahman’s curatorial project “ShohorNama,” the Dhaka edition of the six-city Asian art festival Topography of Mirror Cities.